This Greek style recipe is so fresh and light it screams summer. This is the time of year where my garden is producing zucchini faster than my family can consume. Which means it’s time for a zucchini recipe! 6 medium sized zucchini. Look for thick, not thin. 1/4 cup each chopped mint, parsley & dill. 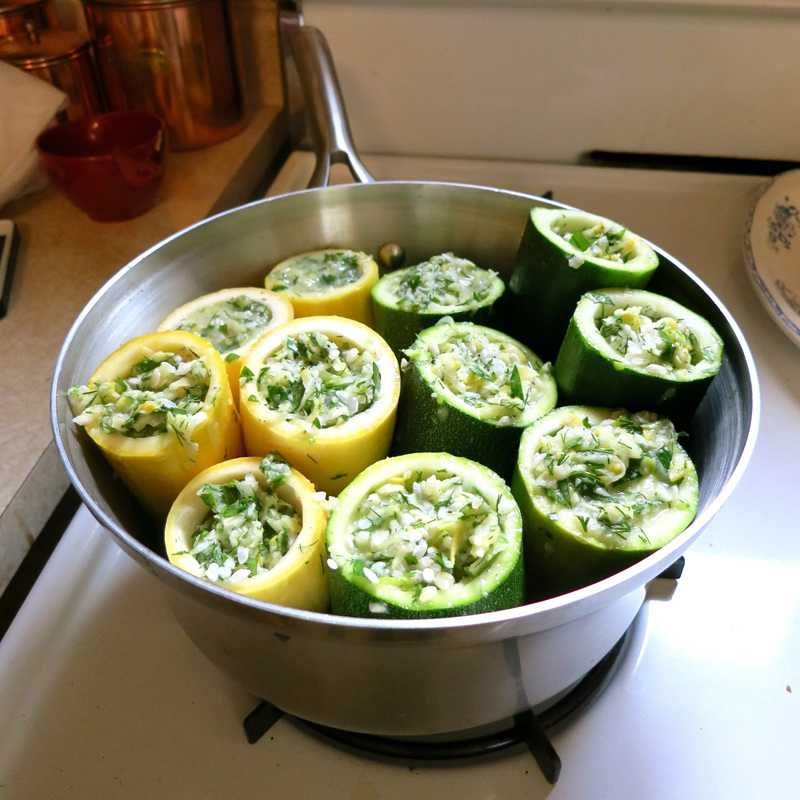 Wash the zucchini and chop off the stems. Chop into 3-inch chunks starting from the bottom. Keep any skinny necks for shredding. Using a melon baller, scoop out the zucchini to make a cup. Don’t go all the way through. Make a cup, not a tube. You need a bottom, ok? Or all the stuffing will fall out. The walls should be about 1/8 inch thick. Reserve the guts in another bowl. Now use your cups to measure what size sauce pan you’ll use. Stand them upright and see what pot will allow them to fit together nice and snug. You don’t want them to fall over. Take your zucchini balls (guts) and chop them fine. Or throw ‘em in the food processor. Also, shred up any skinny necks that you cut away. You’re looking to get about 2 1/2 cups of shredded zucchini for the stuffing. In a large mixing bowl, combine the shredded zucchini, 1/2 onion shredded (put the juice in too), the juice of one lemon, one egg, 1 1/4 cups arborio rice, 2 tablespoons of olive oil, 1 clove of garlic minced, 1/4 cup each chopped mint, parsley & dill, 1 teaspoon of salt, and fresh ground pepper to taste. Mix well. Using a small spoon scoop the mixture into the zucchini cups, filling them almost to the top. Leave about 1/4 inch of room for the rice to expand. Pour one cup of vegetable stock into a sauce pan. Stand your stuffed cups up in the sauce pan, so they fit snug. Bring to a boil then reduce heat to a simmer. Simmer covered for 30 mins. DONE! Let them stand uncovered for a bit before serving so they are not boiling hot. The dill is very pronounced and the lemon makes it pop. They’re also delicious cold. Serve with Greek yogurt. You can also stuff the zucchini flowers with the same filling and set them on top of the zucchini in the pot to steam at the same time. 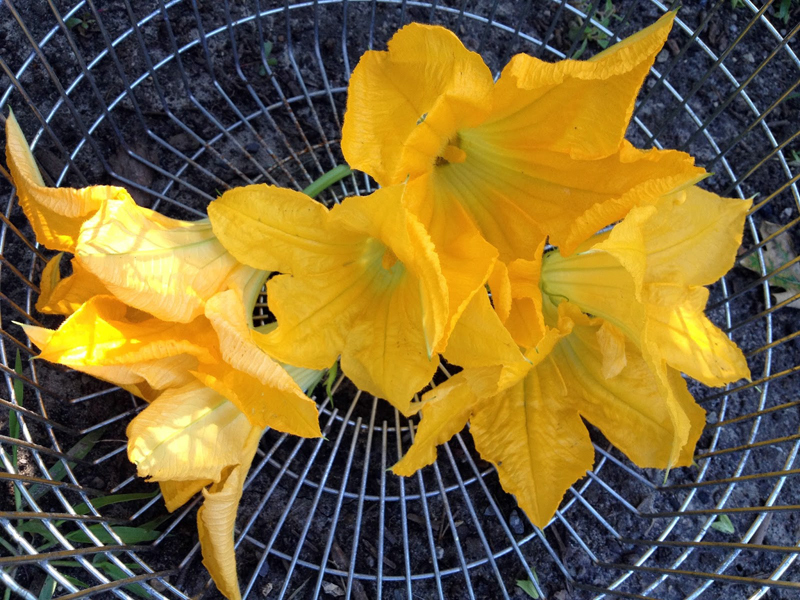 Below is a picture of my zucchini flowers. I stuffed them too, and they were so tender. They are delicate to stuff but I do recommend trying it. Pinch the pollen stick out, scoop stuffing in and fold the leaves over. 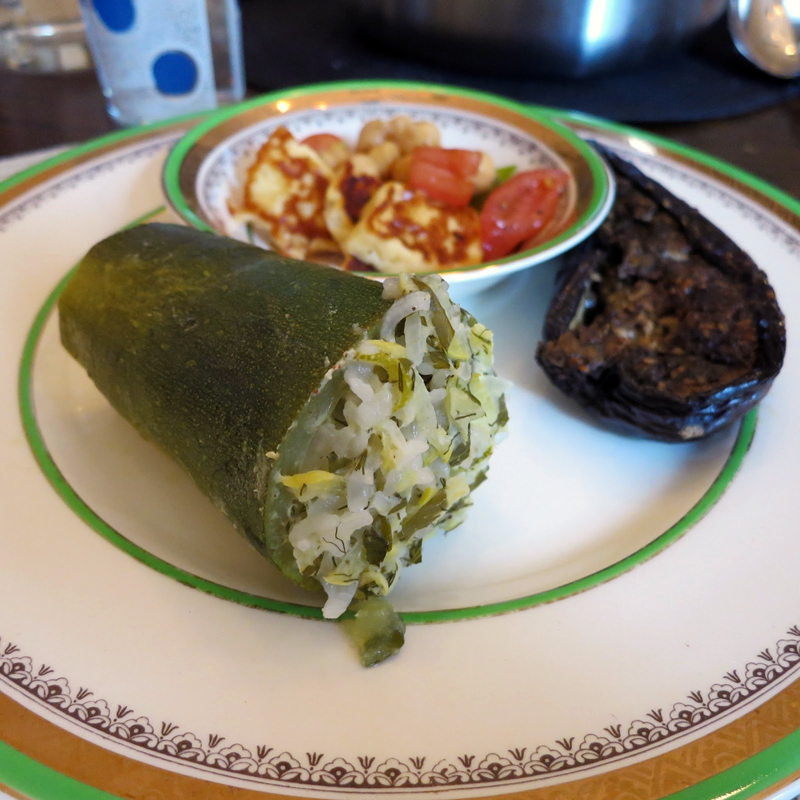 I served up one stuffed zucchini with a tomato-haloumi salad and a grilled eggplant. Special thanks to Yaya Georgina for guiding me through preparing a proper Greek stuffing. She helped me with this recipe.